The Selenite beard oil is the last of this batch of reviews for Savage Alchemy. I have to say that I have been suprised by this scent. And of course the scent is even better in the oil than it was in the balm and butter, the essential oils used are always brighter in an oil and it is here that you get the full beauty of this scent. It is a blend of Sweet Orange, Star Anise & Nutmeg and in the oil it is more sweet, more citrus and the spice scent is fuller and I love it! The base blend is made up using Hemp seed oil, Jojoba oil, Argan oil, Sweet Almond oil and it works very well. It has left my beard feeling softer, looking good and so what more can you ask for? Of course we musn’t forget to work the oil right in and down onto the skin under the beard as the oils will also help to moisturise the skin under the beard. 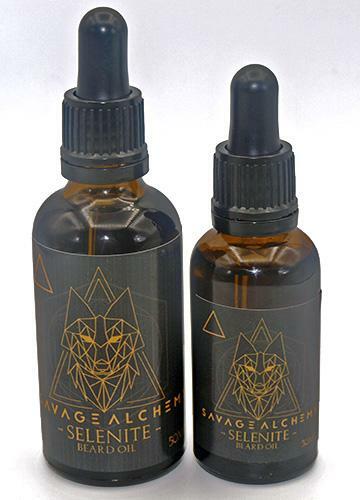 The Savage Alchemy Selenite beard oil is available in two sizes, 30ml for £10.99 & 50ml for £15.99 from the website.